The d20 Character Sheet application handles your D&D v.3.5 and Pathfinder characters. Create new characters. Enter stats, abilities, skills, feats, attacks, notes and add images. Calculation of armor class, initative, base attack bonus and saves. Spell book of known spells. Keep track of prepared and cast spells. Equip characters with weapons, armor and goods. Prestige classes and multi class characters supported! Create your own races, classes, abilities, skills, feats, spells, spell lists, weapons, armor and goods. Always carry your characters with you and show them to your friends. 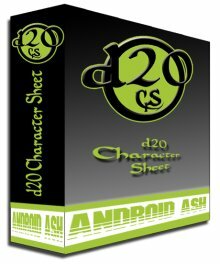 d20 Character Sheet consists of two main parts. The Character Sheet to keep track of your character, which you use while playing RPG. The Administration to customize the game setting to your demands. The app supports portait and landscape mode and includes a full online manual. Backup and restore to/from cloud and file system. Calculates base save and ability modifier. Sum up your money, by counting your platinum, gold silver and copper coins. Make notes of your adventures and store them by your character. The Administration allows you to customize everything in the game, making it unique to your campain.